HomeMaps & CartographyWhere is the Central Meridian? What is the central meridian? 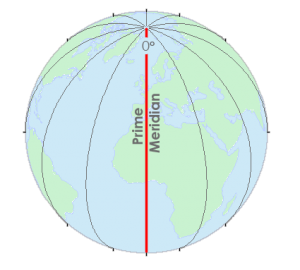 The central meridian is the center line of longitude for projection systems. Projected coordinate systems often use it as a reference point for a x-origin. For example, the state plane and UTM projection systems use a central meridian. Here are some examples of the central meridian in coordinate systems. Latitude lines run east-west and are parallel to each other. Whereas lines of longitude run north-south and eventually converge at the poles. For example, the prime meridian is a line of longitude at 0°. Everything along this line has a 0° longitude coordinate. But the prime meridian (Greenwich meridian) is specific to 0° longitude. Just like how the equator separates north and south, the Greenwich meridian separates east and west. Projection systems use lines of longitude like the prime meridian. Just like how the prime meridian splits east and west, central meridians do the same thing. If you move 3° to the east from the prime meridian, this is the central meridian for UTM zone 31. We assign all X-coordinates (eastings) on the central meridian a value of 500,000 m.
This central meridian is an arbitrary value convenient for avoiding any negative easting coordinates. All easting values east and west of the central meridian will be positive. Each UTM zone is 6° wide. So for UTM zone 31, it ranges from 0°E to 6°E longitude. Then, UTM zone 32 is from 6°E to 12°E with a central meridian of 9°E. 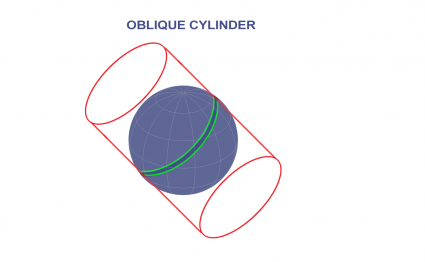 The Transverse Mercator takes a cylinder and places it on its side (rotates it 90°). 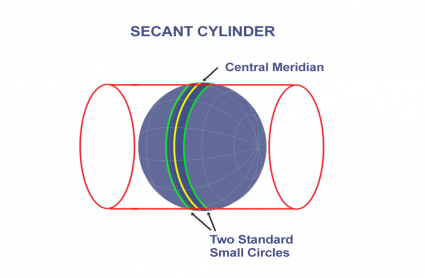 Then, the cylinder intersects the ellipsoid along two small circles parallel to the central Meridian. For zones that are long in the north-south direction, it uses a Transverse Mercator projection. Just like the UTM system, it has a central meridian and two small circles. If the zone is long from east to west, SPCS uses the Lambert Conformal Conic projection. 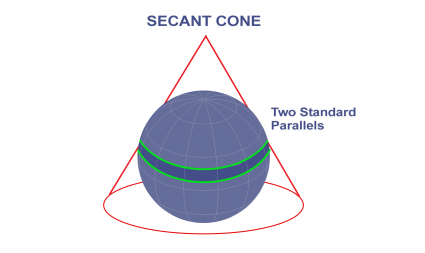 This projection uses a secant cone and had two standard parallels. When zones are long in the diagonal direction, the Hotine Oblique projection uses a cylinder at an angle with a central line. 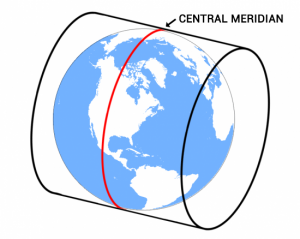 The central meridian depends on which projection system you use. For example, each UTM zone uses the central meridian as an origin for X-coordinates (eastings). Everything in the central meridian is assigned a value of 500,000 m.
This means that the UTM system has 60 central meridians for all of its UTM zones.